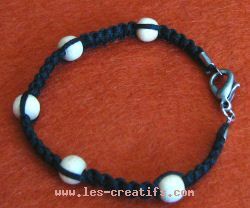 Using basic macramé knots, here are a few bracelets that are easy to make, even for kids aged 8-10 years old, to which beads and other fancy objects can be added ( details of the reef knot technique for macramé). You will need middle strands (for decorative purposes) that are about 13.8 inches long each for a child and 19.7 inches for an adult and twice as long for the outside strands. A cotton thread and wooden bead bracelet in the process of being created. The beads are simply threaded onto the two middle strands at regular intervals along the length of reef knots. For this macramé belt, cotton yarn is used: first of all, create a length of reef knots, then add on a wooden bead and switch the threads round (so that the middle threads do not rapidly become shorter than the outside threads). Next, on an outside thread, thread on a wooden disc, then simply plait together the other 3 threads. Then all you have to do is switch to another outside thread and thread on another wooden disc. By reproducing this pattern at regular intervals all along the belt, you create a completely unique item! This 'ethnic look' bracelet is made using two lengths of fine thread and red chip beads in natural wood. Remember: the thinner the thread, the longer this design will take! A handy hint to ensure a bead is held firmly in place: thread a long bead onto the 2 middle strands and continue with the reef knots on either side of the bead. To learn how to tie decorative knots, and create your own jewelry, customize your clothes and accessories, discover "techniques for tying sailing knots and Chinese decorative knots".